Finished the book, and a little knitting. After dinner tonight, I hunkered down on the couch and finished my book. It was satisfying, and I couldn’t put it down, but it wasn’t quite what I expected. Certain parts of the plot got really intense for a short amount of time, but resolved much more quickly than I’ve come to expect from murder mystery/thriller novels. Maybe that’s a good thing. It’s also possible that I was just chugging through it so fast that the events in the novel seemed to take place more quickly than if I’d read it more slowly in several sittings. Either way, it was good to feel that absorbed-in-a-book feeling again. Like the hat I lost, this hat is made using this Basic Earflap Hat pattern. 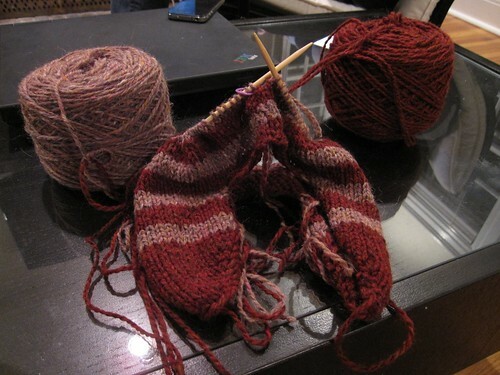 This time, though, I’m knitting at a tighter gauge, so I adjusted numbers a bit. I’m using Peace Fleece yarn and size 6 needles. I’m thinking I’ll have enough yarn leftover for some matching armwarmers or something. I also have another skein of the Peace Fleece in a lovely deep turquoise pattern that I may make into another hat. And speaking of the husky, the latest news is that the shelter he is at has been making arrangements for him to be transported to a rescue here in MN that we can officially adopt him from. We are anxiously awaiting news, checking our emails frantically every time one of our iPhones makes a noise, feeling like little children who cannot wait until their birthdays!